CHICAGO — The New York Islanders played like a desperate team looking to move up the standings in one of the NHL's most competitive divisions. Facing a similar situation, the Chicago Blackhawks turned in one of their worst games of the season. 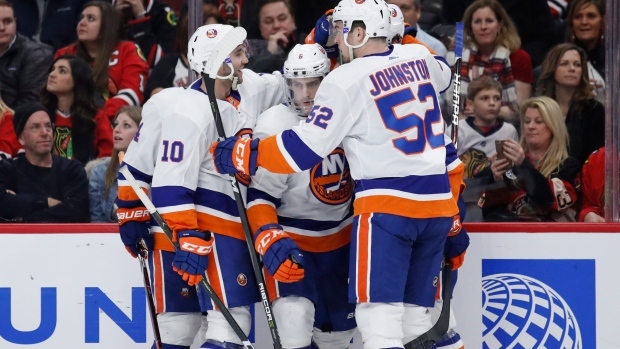 Rookie defenceman Ryan Pulock had a goal and a career-high four assists, Anthony Beauvillier scored two power-play goals and the Islanders beat the slumping Blackhawks 7-3 on Saturday night. "That's a great win and it's the way we've got to play as a team," coach Doug Weight said. Brock Nelson had a goal and two assists and John Tavares added a goal and an assist as New York won at Chicago for the first time since a 4-2 victory on March 15, 2009. Anders Lee and Jordan Eberle also scored in the opener of a three-game trip. The Islanders (24-20-4) had dropped seven of 10, including consecutive home losses to New Jersey and Boston this week by a combined score of 9-3. "We have an offensive team with a lot of depth in the lineup," Beauvillier said. "We can score goals. We can make plays. It's a good way to start the trip." Chicago (22-18-6) returned from its five-day break with its third loss in four games, and is looking at an increasingly difficult path to its 10th straight playoff appearance. The last-place Blackhawks were coming off a 4-0 loss to Detroit that coach Joel Quenneville described as "tough to watch," and they weren't much better against the Islanders. "We put ourselves in a terrible spot going into the break," Quenneville said. "And then coming out of it, we know that we have to have a great run here. So, we've got to move up significantly in our play, in our consistency and our predictability." Patrick Kane had two goals and an assist for Chicago — including his 800th career point — and Anton Forsberg made 30 saves before he was replaced by Jeff Glass after a costly mistake in the third. Erik Gustafsson got his first career goal in his first game of the season after he was promoted from the minors on Jan. 9. Kane's team-leading 19th goal off a cross-ice pass from Gustafsson put the Blackhawks in front 61 seconds into the game, but the Islanders quickly took over from there. "We gave up way too much tonight," Kane said. "It's not a good way to play in front of your goalies. We have to be more desperate defensively." With Chicago captain Jonathan Toews in the penalty box for interference, Beauvillier knocked in a rebound for his ninth goal at 4:35. Eberle jumped on a puck deflected by Blackhawks defenceman Gustav Forsling and flipped it over Forsberg midway through the first, and Pulock made it 3-1 when he skated through the right circle and sent a wrist shot over Forsberg's right shoulder with 56 seconds left in the period. "They had some momentum off the start and we were able to get it back and kind of build off it," said Pulock, who became the first rookie defenceman in franchise history with five points in a game. "I think once we settled in, we played a pretty good rest of the game." Beauvillier added another power-play goal 1:25 into the second, slipping a backhand through Forsberg's legs after he was left all alone in front. It was Beauvillier's sixth goal in six games since he returned from a short stay in the minors. The Blackhawks twice pulled within two, but the Islanders answered each time. Nelson made it 5-2 with his 10th after Forsberg misplayed the puck near the net. After Kane responded for Chicago, Lee beat Glass on a breakaway for his team-high 27th, and Tavares converted a slap shot from the edge of the left circle at 10:30. NOTES: The lights went out for a brief moment 32 seconds into the second. ... The Islanders improved to 17-0-0 when leading after two periods. ... Blackhawks C Artem Anisimov missed his 10th straight game with an upper-body injury, but could return Monday against Tampa Bay. ... Chicago had killed off 19 straight penalties coming into the game. Islanders: Visit the Arizona Coyotes on Monday night. Blackhawks: Host the Tampa Bay Lightning on Monday night.